We stock and supply a large range of Hygienic Butterfly Valves with RJT, IDF / ISS, DIN, SMS, Clamp and weld integral ends that are available with multi-position handles or air/spring and air/air pnuematic actuation. 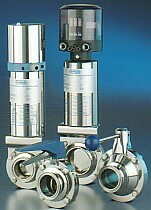 The actuators can be fitted with a control head containing micro-switches or proximity switches and solenoid valves. Please contact us for detailed spec sheets.